Projects that seem completely uninteresting when I'm in my right mind suddenly become irresistible when I ought to be working on something else. Folding tiny useless things out of paper is one of my favorite ways to procrastinate. 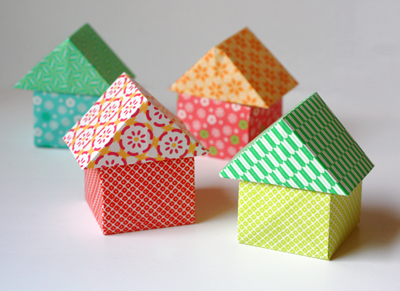 If you have a chore you don't want to do, I recommend making little paper houses by following this diagram. PS: There is an update on baby amden and a new prayer button on arise 2 write. Yeah, I know! I'm working, I'm working! I swear. In fact, I see I'm going to have to take over your proffreeding job, too. Um, "leach"? Yeah, "leach"! Not one of those nasty slimey things! Eeuww!! Adorable, I love this site...the animations are fun and easy to follow! Thanks for sharing. LOL, I do not need anymore ways to procrastinate ! But these sure are cute! "Folding tiny useless things out of paper is one of my favorite ways to procrastinate." Looks like I'll be making these on a daily basis (since I have chores that I don't want to complete - daily.):). These are very cute & my daughter would love to do this! Jessie, my girls were just yesterday asking me if I had any origami books. A friend of mine just retired from teaching an gave us the motherload of origami paper, and we've been having fun getting creative with it. My favorite project so far has been making cupcake liners out of origami paper. I can't wait to show my girls this project for the little houses. Thank you! Wanted you to know I posted a link to this tut today on my blog, PaperFriendly. My last origami episode left me in tears. These scream "try, try again!" that looked so lovely i had to try it.